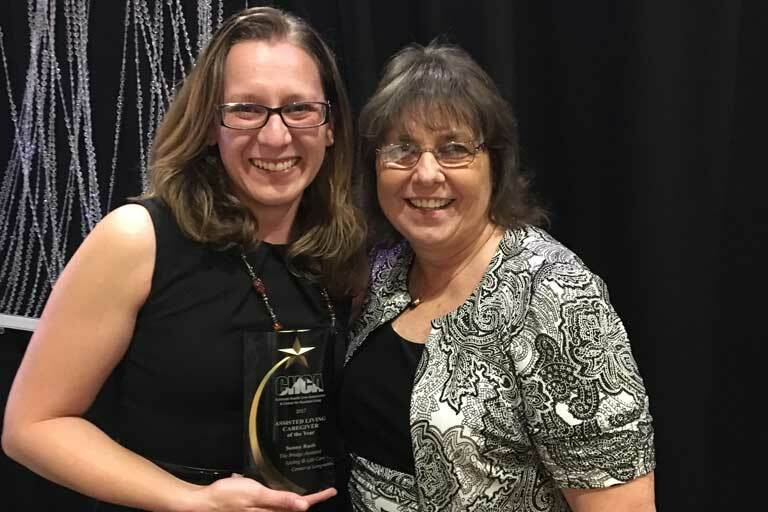 On Sept. 29, the Colorado Health Care Association named Sunny Rush, wellness coordinator at The Bridge at Longmont, Colorado, its Assisted Living Caregiver of the Year. Sunny received the award during the non-profit organization’s annual conference, held this year in Denver. The award recognizes exemplary service. In her role as wellness coordinator for this Century Park community, Sunny works with residents one on one with different exercises that best fit their needs. Sunny frequently goes beyond her job description, covering shifts as a personal caregiver when needed and helping the nursing department with transportation to medical appointments. If a resident passes away, she gives a condolence card to the family and tries to attend the funeral. She writes birthday and holiday cards for residents as well and even bought a belt for one resident out of her own funds. “I could not do what I do without the love, support and teamwork of both the people who live here and who work here,” Sunny added. Century Park Associates is proud of Sunny and thankful for all the caregivers in each of our buildings who go above and beyond to ensure the well-being of our residents.